"We will never compromise away the rights of low income people and the homeless"
"working to prevent the continued loss of low income and affordable housing in our community"
- Yesler Terrace is Next! "The Cost of the Mayor's Agenda in South Lake Union"
- Click here for Coalition opinion piece on "Why Neighborhoods Must Be Concerned About the Mayor's plans for South Lake Union"
- See City Council staff memo showing Mayor's $300 Million Mercer Corridor Plan reduces congestion no more than a "do nothing alternative"
The Mark Sidran Rap Sheet"
Despite spending over $100 million in public funds in the last decade, the city saw a net loss of over 1500 low cost units in downtown since 1985! "City Council Should Adopt Anti-Displacement Resolution now"
Seattle at record levels of growth and more than enough residential capacity yet many more upzones slated for our neighborhoods: how many more existing low income housing units will be lost as a result of runaway growth? Part 1: "Runaway growth threatens Seattle's livability but pro-growth lobby demands still more -expososing the myth that Seattle isn't bearing its fair share of the region's growth"
"a look at the top candidates for Mayor and who will best represent our communities"
Proposed "TIF" law would rob city's tax base for special interests! - including monies from our Parks Levy, Housing Levy, MFTE Tax Breaks, Bridging the Gap, and more! Also, Click here for chart to see why SHA can complete the project without use of any city funding! In spite of a “Ten Year Plan to End Homelessness,” a combined city-county outlay above $50 million annually, and over 50 programs (and easily 2000 staff) providing shelter, counseling, case management and services, the number of homeless continues its steady climb upward. Why, despite such extraordinary effort and expenditure, does the problem continue to grow? Seattle reaches 73% of 20-year 2024 Growth Target in under 7 years! Our current zoning has more than twice the capacity needed to accommodate our 2024 target but pro-density developer interests say that's not enough and call for still more upzones and other "developer incentives"
Call your Councilmembers Now! Tell them you do not favor placing a 20-year $80 dollar increase in our car tab fees on the Fall ballot! - Keep it off the ballot this year, replace the current advisory committee stacked with downtown and development interests, make sure most of the dollars go to critical bridge and road repairs, cut the amount and length of it in half, and match amounts this will raise with developer impact fees to so developers pay their fair share! Mirror, mirror on the wall, who’s the fairest City Councilmember of all? For over 35 years, I’ve closely followed the City Council races and listened to hundreds of candidates’ speeches and pledges. They all tell us they are going to do something for our transportation woes, make city hall more accessible, guarantee jobs and improve public safety. No matter how much density a neighborhood accepts, it will never be enough for some people. Take the letter sent June 3 from a small group calling itself “Leadership for Great Neighborhoods” (LGN). It urges the mayor to overthrow the democratically developed Roosevelt neighborhood plan in favor of its own vision of “much higher densities” around a rail stop planned for that community. Recently Seattle Housing Authority’s (SHA) board unanimously approved moving forward with redevelopment of Yesler Terrace. The 561 units of public housing on the 28-acre site just north of Harborview will be wiped out and replaced with as many as 5000 units of mostly high-end apartments and condominiums. "Calling all challengers - your recipe for a City Council bid"
According to King County’s 2010 Housing Benchmarks report, in Seattle there are about 30,000 households with incomes at or below 30% of median ($23,150 for a 3-person household). Yet, the report says, there are only 310 unsubsidized units in all of King County renting at levels affordable to this income group. Looking ahead to the 2011 Seattle City Council election, it’s not too early to start thinking about how to make City Hall more responsive to our neighborhoods and the cause of social justice. The five seats now occupied by councilmembers Tom Rasmussen, Jean Godden, Tim Burgess, Bruce Harrell and Sally Clark will be contested. Attention: 580 Public Housing Units At Stake! November 2010: An Updated Report on SHA's plans for Yesler Terrace and surrounding community. Will it turn into another HOPE VI-like debacle with hundreds of millions of limited housing dollars going to redevelop the last of our historic garden communities only to come out at the other end with a loss of hundreds of very low income units most needed in our city? Last week, Mayor Mike McGinn presented his first budget to the Seattle City Council. These are tough economic times, and the mayor needed to make up for a $67 million drop in local tax revenues that normally would have supported programs covered by the general fund, plus significant shortfalls in non-general-fund sources such as user fees, utility rates, state and federal revenue sources. In a surprise decision, a narrow majority of Seattle’s Landmarks Preservation Board voted to nominate the community center building and steam plant at the 580-unit Yesler Terrace Public Housing Project for landmark designation. If the Board affirms their vote on October 6th these two structures would gain protection under the state's Historic Landmark Laws. They still need $100 million for Mercer West Phase II – what other critical needs in our city will be sacrificed to cover that cost? We’re hearing it again, the hue and cry from the University District Chamber of Commerce that the “U-District” and its main thoroughfare, University Way or “the Ave,” have become another Sodom and Gomorrah. I’ve kept a UW Daily from 1970 featuring the same stories we read today about the druggies hanging out on the Ave and fears about rising crime rates. The Chamber is quoted railing about all the street kids running amok and driving away businesses and shoppers. They were hippies, not punkers or Goths back then but the moaning and groaning sound like today. Folke Nyberg Passes Away at Age 76: His contribution to our city's character should be remembered! Last week Professor Emeritus, Architect, Planner, and longtime "Neighborhood Activist" Folke Nyberg passed away from prostrate cancer at the age of 76. While he was not so visible in recent years on the political scene, for at least four decades Folke's writings as well as his actions had a profound, albeit more often behind-the-scenes, impact on Seattle's physical, social, and political landscape. He also was a force whose inquiries into these arenas had a great impact on the way I personally understand and respond to these things. Something truly marvelous that happened this month — in fact, something that happens only rarely, like the sighting last summer of a mountain bluebird in the Montlake Fill. It left us feeling that exhilarated. There’s a group of activists who likely will never have their names inscribed on a plaque. Only occasionally do you hear about them when they’re quoted in the local media speaking out against freeway expansion or working to save a grove of “heritage” trees or historic building threatened by redevelopment in their neighborhood. can you be pro-growth and still be "green"? For decades, government and industry leaders and many who call themselves environmentalists have claimed we can have economic growth and still protect the natural world from destruction and pollution. In fact, some have claimed that without growth, we can't provide that protection. Over the last few weeks Seattle Children's Hospital and its allies have unleashed a no-holds-barred media campaign demanding that the City Council approve Children's proposal to triple its development in the Laurelhurst neighborhood, located just east of the University of Washington. With his planned panhandling law, does Councilmember Burgess want to take us back 15 years to the era of Mark Sidran and Margaret Pageler. As former city attorney and City Council member respectively, Sidran and Pageler authored the notorious "no-sitting" and "parks exclusion" laws and other anti-homeless "civility" ordinances. As we head into the final elections for City Council and Mayor, we’re surprised how little press coverage these races have received. And how little of that focuses on where the candidates actually stand on key issues. I just got through reading a host of candidate ratings, questionnaires, blogs, and endorsements from various group's around town. It's enough to make George Orwell (and me) laugh and cry. You've got groups who make up "FUSE" a self proclaimed "progressive" coalition endorsing corporate candidates like Sally Bagshaw and Jesse Israel. Both candidates, especially Bagshaw are bankrolled by downtown, Paul Allen, and real estate interests. Given who they've ignored, FUSE has only demonstrated with their listing just how out of touch they are with the Seattle political scene. Over the years we’ve heard some neighborhood activists claim that Southeast Seattle has “become the dumping ground” for the city’s social services and low-income housing. They allege this has something to do with the greater incidence of poverty there than elsewhere in the city. Crime, they say, is the inevitable result. Stop giving us more than our share, they say. We’ve also heard fears that because of these services and housing, Southeast Seattle has become a “magnet” attracting poor people from out of state to congregate in this community seeking all these great programs. Some of this sentiment fueled opposition to Casa Latina’s ill-fated plan to relocate to North Rainier, as well as resistance to the Downtown Emergency Service Center’s successful homeless housing project in Columbia City. And we fear it may fuel opposition to the new housing levy on the fall ballot. Mayor and City Council try again for Obama stimulus funds for the Mercer Corridor Project – over $50 million! - Biotech has tanked in South Lake Union. Not because of the recent downturn, it is a long term trend only exacerbated by current conditions! Changing the levy to provide housing at rents thousands of dollars above what the average family can afford in order to serve households with much higher incomes is not a formula for winning voter approval in a deep recession. What did Jan Drago (and the Mayor) know and when did they know it? Rep. Clibborn says today that Drago knew last week that funding wasn't in the stimulus package and so did the Mayor - So why then didn't Jan Drago and/or the Mayor inform the Council of this fact before yesterdays 6-3 vote to release funding and break ground on the Mercer project? "When you count monies already spent on SLU including the streetcar, city staffing & planning, use of Mercer land sale sale revenues in SLU, the costs easily top $900 million! If they actually go ahead with 'phase II' Mercer Plans - costs would easily top $1.1 Billion!" * Mercer Corridor's full costs continue to rise: $230 million total and that's only for "phase I". "Even without a roads component, the Prop 1 Transportation Package (really a rail package) is still a budget busting, sprawl inducing, global warming carbon-emitting lemon and here's why"
The Mayor and City Council are at it again. As early as this September, they will be entertaining a proposal for “incentive zoning” which would allow nearly a doubling of densities in neighborhood business districts, mid-rise, and high-rise residential zones. To prepare you for this onslaught, we have put together a citizen’s handbook of planner jargon – nice-sounding euphemisms they’ll be spoon feeding you to neutralize any concerns you might have about the changes coming to your neighborhood. When you hear these phrases, watch out! Councilmember Clark seems genuinely interested in ensuring a more creative approach to townhouses. Unfortunately, as we have seen over and over again, when discussions around zoning changes begin at the community level with earnest dialogue, citizen workshops, and lofty promises about reflecting community concerns and good design and other highfalutin’ values in new zoning, once the final decisions are made, we get something quite different. In recent months, the police have launched crackdowns on homeless encampments that have popped up with increasing frequency in our city's greenbelts. On the west side of Beacon Hill and more notably on Queen Anne Hill, police, aided by parks department personnel have raided make-shift little cities, summarily removing residents' belongings with not so much as a notice or attempt to assist affected individuals. In recent weeks, we’ve heard that some fellow progressives may cast their vote, however reluctantly, in favor of Proposition 1, the transportation package slated for the November ballot. Proposition 1 is the single most wallet-busting, wasteful, regressive, carbon-emitting, elite-driven, gridlock-ensuring, misguided funding request ever brought before the voters of this region. - click here for a look at the races and the candidates - so far the races for the contested seats are "bland bland bland" The voters are crying out for someone to speak out strongly on the issues they care about. A week before Father's Day, my father John Noel Fox passed away in a congregate care facility in Bellingham, just one month shy of 90. I had the difficult but very real privilege of being there when he died, along with my sister and one of his nurses. It is painful to lose a loved one - to sit back and helplessly watch him fade away. But I know that he lived a long and very good life. - the Mayor's pro-density agenda threatens hundreds and hundreds of low income units in our city! Condo Conversion Bills SSB 5031 and HB 2014 Under consideration: call or write them today - click here for details & click here to see joint letter calling on electeds to pass legislation giving back to cities the right to limit the number of conversions devastating their communities. I the spring of 2005, the Mayor's office released a 23-page "action agenda" containing several dozen recommendations for revitalization of Southeast Seattle. Developed with the help of the Rainier Valley Chamber, Southeast Effective Development (SEED), Homesite, and prominent area banking institutions, the agenda included a seemingly innocuous recommendation for a “community renewal plan” for Southeast Seattle. Leaping ahead to the fall of 2006, a firestorm in Southeast Seattle has been ignited over the Mayor's attempt to implement that plan. It calls for the City Council to designate a special "community renewal area" or CRA with boundaries stretching from I-90 to the south city line and encompassing nearly every block between Martin Luther King Way and Rainier Avenue. When we're not busy uncovering the high jinks of our mayor and his wealthy backers, or striving to save low-income housing from destruction by developers, or urging the city council to hold Seattle Authority accountable for its use of public funds, we both have a pastime for relaxation and renewal - watching birds click here for rest of story. A Fishy Legislative Stew is Cooking up at City Hall" OUTSIDE CITY HALL: A view of issues affecting Seattle's Neighborhoods by Carolee Colter and John V. Fox 2/23/06 Things are heating up down at city hall. Our column this time is an attempt to give readers a heads-up on key issues our city leaders will be addressing over the coming year. Call it our hit parade of what really matters to the neighborhoods, particularly communities often left out when city resources are distributed. Much is said about the need for accountability in government spending, but when it comes to action, we’re like the mice in Aesop’s fable asking, “Who will bell the cat?” A provision in a bill from state representative Mark Miloscia might just put a bell on the cat’s collar when it comes to Seattle Housing Authority’s continued destruction of low-income housing and the use of state money to pay for it. "Local Unsung Heroes Recognized for their Community Advocacy": OUTSIDE CITY HALL December 2005: Since the holidays are a time of good cheer, the two of us thought we would shift the attention of this column away from our usual focus on our city leader’s hapless misadventures. In the spirit of the season let’s turn from our city’s dismal lack of leadership at the top and the pessimism it engenders to look instead down into our communities where real leadership is always found. There are many unsung heroes out there working away at the grassroots and for this column what we want to do is feature some of them who because of their tireless efforts actually give us hope for our city’s future. News flash: South Lake Union Streetcar Benefits Go to 17 Large Property Owners While Small Property Owners Get Socked! us to swallow some grand scheme, they’ll point to Copenhagen, Singapore, Manhattan, even Portland and tell us we’ve got to emulate them and “grow up”. Now we’re being urged to look north to Vancouver. "Strippergate Can't Hold a Corrupt Candle to Vulcangate"
"Council Votes 7-2 to Go-Ahead with Paul Allen's Street Car"
"Plan to end homelessness ignores root causes"
Every day in King County over 50 social service agencies provide shelter and/or counseling to 2,500-3,000 homeless people. City and county governments fund these programs to the tune of over $20 million a year. Nevertheless, the number of homeless on our streets has continued its relentless upward climb. A new effort has recently emerged boldly calling itself the committee to End Homelessness. Over two dozen social service agencies, church organizations, King County, the City of Seattle and United Way have combined forces and promised to guarantee "a roof over every bed" by 2014. But in spite of its goal to "end homelessness, not manage it," the plan is conspicuously lacking in programs and strategies that would attack the problem at its roots. "Seattle's empty promise of preserving affordable housing and what can we do to change that"
Every year we lose about 2,000-4,000 low-income units to demolition, speculative sale, abandonment, conversion and increased rents. For every one unit we build with limited public funds, we lose three to four times that amount to the forces of redevelopment and gentrification. As we write this column, the land use committee of the Seattle City Council is entertaining changes to the downtown land use plan and zoning changes elsewhere around town proposed by the mayor. This will translate directly into the loss of even more low-income housing in our city. - PR event cannot disguise the fact that his plan is little more than a blueprint for more housing demolition, abandonment, increased rents, and more homelessness in our City! 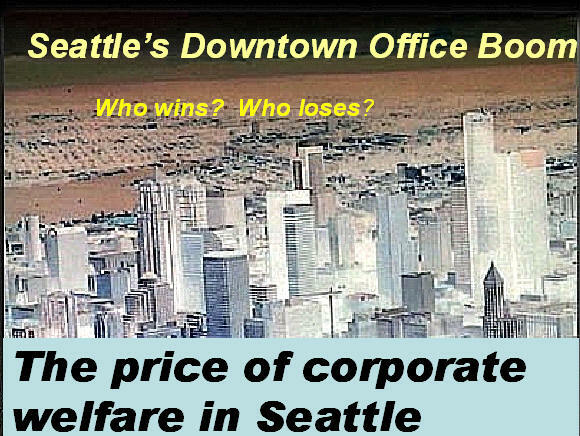 May 12 2005: Displacement Coalition Bulletin #45: (please circulate) Special benefits study shows South Lake Union property owners will rake in 70-80 million in increased property values if streetcar gets go-ahead but they refuse to pay more than $25 million of the cost. - Limiting property owners contribution while passing much of the cost on to taxpayers apparently is OK with the Mayor and most Councilmembers. And guess who gets the lions share of that increased value? Yep - it's Paul Allen! Let the Mayor and Councilmembers know what you think about this one. The controversy around the plans for the old Chubby & Tubby site on Rainier Avenue reveals the outlines of a struggle for the soul of Rainier Valley. Despite the fact that Casa Latina provides jobs, counseling and other services to a population of Latinos that make up a significant percentage of the Southeast Seattle population (about 8 percent), the scions of the business community were outraged that the city was willing to provide funds for CASA Latina at this location. Given that 40 percent of all Rainier Valley residents are foreign-born, one wonders why the Chamber would cast such a negative light on a program that serves immigrants (click headline above for full story). A valuable housing resource for Seattle's low-income families is threatened by the Seattle Housing Authority (SHA) and our city council seems poised to let it happen without a peep. In the late 1970s and early 1980s, with a combination of federal and local housing levy dollars, the city of Seattle oversaw the construction and acquisition of over 700 units of "scattered site" public housing. Mayor Charles Royer had a lot to do with initiating this program and securing those federal dollars. The Myth that the City has no authority over SHA actions is just that - a myth! for more information and to see documents establishing SHA and the City's continuing authority over SHA actions, click here. "For over three decades neighborhood groups, low-income housing advocates, and environmental organizations have worked together. Their collective efforts led to passage of the Growth Management Act, Shorelines Act, and other environmental laws. They blocked the Bay Freeway, the I-90 and 520 expansions and a host of other bad auto-oriented projects. They worked together, locally, to secure support for growth limits on downtown high-rise expansion, controls on demolition of low-income housing and helped preserve the Pike Place Market. Now it seems, in an attempt to advance an aggressive pro-density agenda, our mayor and a few other elected officials are trying to pull these natural allies apart." Council votes to fast-track and limit environmental assessment while SDOT also has revoked earlier decision to require an EIS! - Ordinance and Resolutions releasing the Mercer Corridor funds Re-Crafted to Guarantee there will be NO state or federal EIS review nor study of less costly options that might really do something to relieve traffic congestion in the area. - What is the City Council doing releasing $1.8 million in limited city funds for study and environmental review when we already know they're going to conclude No EIS is necessary? - City Council votes to release $1.8 million in city funds to fast track study of the Mayor's $200 million 2-Way Mercer "Non-Fix" Another $600,000 in 2005 City General Funds may also be released! "The City Budget - Good or bad for our neighborhoods and low income people?" October News Flash!! What's in 2005 budget for Mayor's South Lake Union Agenda! There's a half billion dollar backlog of neighborhood transportation needs and this is what the Council is doing with it's time and our taxdollars - figuring out how to help Paul Allen build his trolley to nowhere! Expect more cuts to human services and to neighborhood programs next year to pay for it as well. Bus Service may also be cut back in Seattle to cover operating expenses. "Paul Allen should pay for his own darn trolley!!" "Special Report on HOPE VI by John McLaren": click here for the full report which provides a useful and important analysis of the status of this federal program and how it has been used here locally and nationally as a tool to dismantle our nation's and city's public housing stock. The Seattle Displacement Coalition is a 26 year-old region-wide low income housing organization, made up of low income residents, the homeless, and representatives of social service, church, civil rights, women's, and community-based organizations. It is a volunteer community organization with a staff of 1-3 people depending on its current funding and current activities. The Coalition was created to provide a forum for affected people and their supporters to call for preservation and expansion of low income housing and other measures that ensure a fairer distribution of economic and political resources in the Seattle/King County area. The Coalition has a long track record of building successful campaigns around winnable low income housing legislation and it has successfully represented and built leadership and participation among groups of low income tenants, and the homeless challenging developer/city actions that threaten those communities. The Seattle Displacement Coalition works with low income and homeless people - and people at risk of becoming homeless - of all racial, age, and economic backgrounds. Through direct action strategies, we organize affected people around real objectives that will make a difference in people's everyday lives while developing a capacity among these groups to move on to larger system-redefining objectives. We also link the activity of affected groups to the activities of a broader area-wide coalition that includes church, civil rights, community, and labor organizations that supports not dominates a homeless and low income agenda. 1. Housing Issues Campaign designed to prevent the continuing loss of low income housing in our city to demolition, abandonment, conversion, speculative sale and increased rents: This initiative is designed to focus the work of housing and homeless organizations, and homeless and low income people themselves, around winnable legislative objectives, by broadly publicizing the need for a renewed housing movement through publication of regular e-mail bulletins ,and then directing that energy and participation into a campaign to secure housing reforms in Seattle. A Right of First Refusal Law would give tenants in low income housing the right to form their own non-profit or link up with an existing non-profit and buy the apartments they are renting if that housing is slated for demolition or speculative sale. These tenants also would be given access to public funds needed to assist them in that purchase so their buildings could be converted into cooperatives, land trusts, or other forms of permanent low income housing. Click here for a copy of our proposed right of first refusal law. City Council Resolution Creating a Task Force to Assess Displacement now occurring in our neighborhoods. The 15 member task force appointed by the head of the Council's Housing Committee and staffed by the Office of Housing would have six months to assess the problem, compile data, and come up with a set of legislative recommendations for Council adoption before the Council moves forward with the Mayor's plans for significant upzones of several neighborhoods in the City. We must have housing preservation mechanisms in place before any further changes in zoning occur that would only accelerate the loss of low income housing in our city. See above headline for more information or click here to jump to another web page for more information on our anti-displacement resolution. 2. “Homeless Civil Rights Organizing”: a continuance of our campaign to build participation among homeless people of all ages around the goal of turning back laws and local government actions that threaten the civil rights of the homeless, and to link that participation with active support from civil rights, church, community, and labor groups. . We aim to redirect public policy back towards provision of housing, jobs, and services rather than jails for the homeless. Measures implemented during the Sidran/Pageler era at City Hall that must be overturned include the "no-sitting law", pedestrian interference law, car impound law, use of trespass admonishments, and parks exclusion law. For information on why Mark Sidran should never be elected to public office again, let alone the position of State Attorney General, click on the box just below for a compilation of his dismal anti-homeless and anti-civil rights agenda. For more information on the specifics of each of these anti-homeless laws, click here: jump to anti-homeless laws discussion. 4. Holly Park, Rainier Vista, and Senior Housing - Holding SHA Accountable : For several years the Seattle Displacement Coalition has been engaged in a concerted effort to hold our Seattle Housing Authority accountable to its underlying mission of providing units to our City's poorest residents. In 1997, we worked to ensure 100 percent replacement of any units lost at Holly Park due to SHA's HOPE VI redevelopment of that site. Our efforts did not stop the destruction of over 400 low income public housing units but it did result in passage of a low income housing replacement plan in which SHA committed to contributing dollars towards off-site replacement of a portion of those units. We helped bring together representatives of labor, housing, and community groups and launched a campaign to challenge SHA’s plans at Rainier Vista as well - another HOPE VI project that will result in the loss of 170 public housing units. As a result of a lawsuit we filed against that project (joining Friends of Rainier Vista and tenants represented by Columbia Legal Services and the NW Justice Project), we were able to force SHA to solidify an off-site replacement plan and secured commitments from them to undertake efforts to avoid loss of low income public housing at Yesler Terrace when they launch redevelopment plans at that 550 unit site. We also won a commitment to rollback rent increases on the 1000 unit Senior Housing Bond Program(SSHP) and to look at alternatives to that policy. The result was a permanent rollback of the rent increase for low income seniors the program coupled with more modest increases over time on higher income residents living in SSHP units. We also organized residents of this program so that now in each building under this program, there are representives who participate in a resident based organization made up of program residents. This group the SSHP Advocates have a board and are not effectively representing their own interests. We will continue to monitor SHA’s compliance with its housing replacement obligations at each of its HOPE VI projects (where over 1000 public housing units were torn down). We will seek to redirect SHA projects like its current plans for the 550 unit Yesler Terrace Public Housing Project that would cause the loss of additional low income units, and instead promote alternatives that ensure "no net loss" of existing public housing. Due to federal budget cuts and regulatory changes, housing authorities across the country are dismantling their low income housing by converting it to market rate, selling it off for market rate development, or moving to mixed income strategies rather than serving those most in need. By maintaining a broad coalition of church leaders, community leaders, housing advocates, social service providers, and affected people themselves, we will seek to prevent further losses of public housing here in Seattle. Five years ago, the Displacement Coalition working with a broader coalition of these groups secured passage of a state measure that restructured the Seattle Housing Authority - expanding the board, forcing more frequent review of current board appointments, and requiring city council approval of all board appointments and extension of board appointments. Also the law required that 2 of 7 members of the board now are public housing residents. It also strengthened conflict of interest language. The effect of this bill has been to force more accountability out of this agency. 4. Homeless Youth Organizing and Housing Project : In total for this project we raised over $40,000 which covered our 1996-1997 expenses. We also entered into a relationship with the Low Income Housing Institute and secured a significant Stewart McKinney Grant which paid for the purchase of a single-family home (under LIHI’s name) and that covered most operating expenses. After helping launch this effort and ensuring that it would continue, this project was split from the Coalition. It now is a task force of the Church Council and to a large degree, it retains the unique characteristics of the project that distinguished it as one of the state’s only truly “independent living” projects for homeless youth. 5. Challenging development and policy decisions that cause displacement: A key focus of ours is to challenge the misdirection of limited city resources - the city’s continued commitment to spending for downtown development and in South Lake Union at the expense resources we need for low income housing and our neighborhoods. In the past, we sued the City and filed a complaint with HUD charging misuse of federal Section 108 funds for development of a new Nordstrom store and a downtown parking garage. These were federal monies had been intended to curb blight and address low income needs. Our complaint forced changes in the Section 8 program and because of former Norm Rice's role in the deal, it cost him a cabinet position. Click on the photo for a picture of one of the Coalition's 30 benches built by volunteers and dispersed throughout the City. It is an atte mpt to 1) provide a needed amenity in community business districts where cooperating merchants requested them, and 2) to make a statement against our City's "no-sitting" law approved in '92 sponsored by none other than Mark Sidran and Margaret Pageler with support of Mayor Rice. This law is an explicitly anti-homeless (and anti-city) measure that only serves to drive a deeper wedge in our community between rich and poor and black and white. The answer of course to people sitting on the sidewalk is BENCHES, not banning sitting and the more the merrier. The benches were designed and constructed of heavy duty materials weighing about 80 pounds each. Most were built 3-4 years ago and can be seen in areas like Ballard and Capitol Hill. The Bench Project also was a great community builder for our supporters and is a classic example of "direct action". For those interested in doing another bench project, give us a call or e-mail us. Organizational Structure/Administration/Decision-Making: Established by a formal board vote in 1977. these practices have been functioning effectively since then. They are affirmed regularly through board action and identified in all of our grant applications when such information is requested. The Seattle Displacement Coalition is composed primarily of people directly affected by the low income and homeless issues we are addressing. In addition, the Coalition draws support and volunteers from representatives of church, labor, civil liberties, community, women's, and social service organizations, and the larger residential communities. More than 500 people have attended at least two Coalition initiated activities in the past year. The active "core" of the organization is comprised of about 50-75 people who regularly participate in the on-going activities of the organization and includes people of color, people of diverse socioeconomic levels (at least 50 percent low income), and people of different ages. For every issue we address, the work of the Coalition is heavily weighted towards securing increased levels of involvement and building leadership among people who are homeless, senior citizens, and low income. The Board of the Coalition is a standing group that varies from 10-20 people who confer regularly to set directions, undertake fundraising, and identify key issues that the Coalition will work on in any given year or month (see attached list of participants and their socioeconomic backgrounds). Decisions at these board meetings are made by a process of democratic consensus. All must agree, and if that is not possible we revert to “majority rule.” In those rare cases where we revert to majority rule, only those who have attended at least two previous board meetings may vote. Policy direction and issue selection are set at these larger boardmeetings and the activities of the subcommittees are reviewed and approved at these boardmeetings. Each subcommittee reports back to the Coalition board at meetings of the Board. It is within these subcommittees where strategies and actions are determined for that issue. Meeting times are set by participants within each subcommittee and all decisions are made by a process of democratic consensus. These committees are made up primarily of people directly affected by that issue, with staff and interested boardmembers attending and assisting in particular subcommittee activities. Staff and consultants for the Coalition function as organizers and trainers, identifying and encouraging leaders and promoting participation, sharing their skills and expertise on issues, providing the subcommittees with access to the Coalition's office space, and its copying, mailing, phone, and other office resources. Staff and consultants also assist in fundraising, and in helping to coordinate volunteer activity. Staff and Coalition boardmembers always function in a level as "co-equals". Over our 26 year history, we have not given ourselves titles other than boardmembers and participants and spokerspersons who operate within these committees, with the aim of bringing out the innate skills of all participants - especially the homeless and other low income people. The subcommittees are given a high degree of autonomy, and as they progress with their work, if they deem it necessary, may even establish their own independent identity. When appropriate, the Displacement Coalition has encouraged this because it creates a greater sense of ownership of that effort. Over time in this way, the Coalition has generated efforts that have evolved into their own self-sustaining organizations. It also is a way for the Coalition to make very effective use of our limited resources. The volunteers, homeless participants and advocates, and organizational representatives playing a direct role in carrying out these projects/ In total, those participating in this project at an active level, carry many years of combined organizing experience and work in the community.